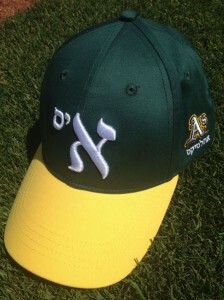 For the sixth consecutive year, the Oakland A’s are presenting Jewish Heritage night at the Oakland Coliseum. This year, the A’s will be playing the Baltimore Orioles. In addition to great Field Level seats, each ticket includes a hat and traditional Jewish-themed dinner before the game in the Eastside Club. On this year’s menu: Mediterranean Salad, Falafel Wraps, Kasha Varnishkes and Chicken Paprikash. Yummmm! Plus, you will receive free parking as it is a Chevy’s Free Tuesday! A Klezmer band will serenade the crowd and PA system played Jewish favorites between innings. You must reserve your seats in advance.The price for this evening of gifts and entertainment is only $28 per person. Deadline to reserve your seats is this Friday, July 17th. We need more sign-ups to meet our goal! All seats are reserved, and Kehilla will be one of many Jewish groups from around the Bay Area to participate. Last year, we had almost 50 signups from Kehilla for this wonderful event. You can PURCHASE YOUR TICKETS ONLINE HERE, or send check payable to Kehilla and indicate that it is for A’s Jewish Heritage Night. PLEASE NOTE that there will be no hard copy tickets. Your name will be at the box office. The name of the person picking up your tickets at the box office must be given to us in advance, either on your check, or with your online order, and that person must bring an I.D. with them when they pick up the tickets. This is very much a family event, so don’t hesitate to bring your children, your parents, your grandparents, friends and your neighbors for a fun evening with Kehilla and the Oakland A’s!